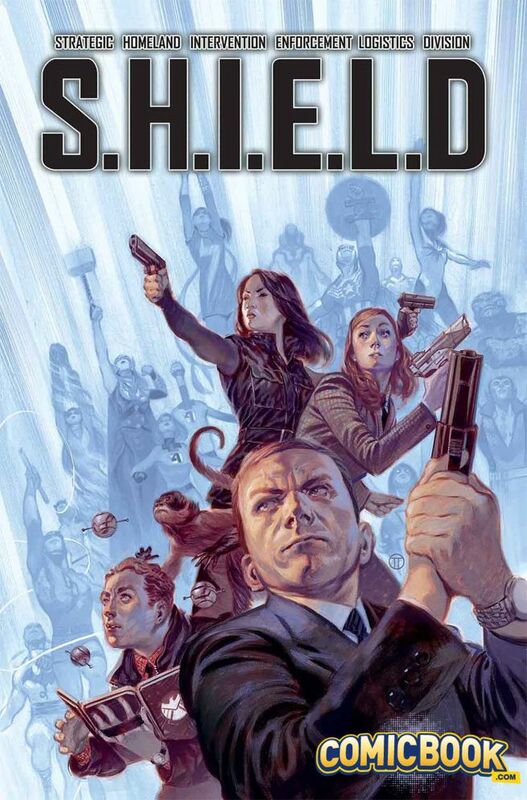 Marvel Comics have given ComicBook.com an exclusive sneak peek at the cover for the first issue of Mark Waid's S.H.I.E.L.D. series -- and it's a doozy. As you can see above, this represents our first in-universe look at Agents Melinda May, Leo Fitz and Jemma Simmons, who will be part of Coulson's team in the book. Whether the series will feature other TV creations like Skye and Grant Ward isn't yet clear. "I can’t imagine it would exist without it, but it’s not like it’s some sort of weird adaptation of the show," Waid told us during a recent interview. "It’s a straight-up Marvel Universe S.H.I.E.L.D. series. The great news is, not only do I have all of the Marvel Comics S.H.I.E.L.D. elements to play with, we have the added bonus of being able to introduce the MU versions of May, Fitz and Simmons, and the others." The series launches in December and will feature a revolving team of artists and one-and-done stories that serve an interconnected broader narrative -- again, not unlike a TV show. Waid told us that the appeal of such a format is "That it allows for fun guest-stars picked from through the Marvel Universe, from Spider-Man to Ms. Marvel to the New Warriors to Rocket Raccoon. One mission, one story, they’re in and out. But the appeal there is mixing and matching combinations of characters that are surprising. Vision and Baron Mordo? Magneto and Invisible Woman? Two-Gun Kid and Dr. Strange? I’ve got ideas for all these and more." Interior art for the first issue will be drawn by Carlos Pacheco, with this cover above provided by Julian Totino Tedesco. Marvel's Agents of S.H.I.E.L.D. Season One is on Blu-ray and DVD today.